USED in Box Multimedia Epson EX7240 Wireless Projector Working for Refurbishing . Condition is Used. It came from a Retro Fitness movie room and it played but only in black and white. For parts or refurbish. Fully tested and works fine. the functionality of this item. This projector has a used 3,128 lamp hours on normal mode. (1) Power Cord. (1) VGA Cable. and 111 hours on ECO mode, for a total of 3,239 lamp hours. WHAT'S INCLUDED Projector Only. ANY UNLISTED ACCESSORIES. Power Cord. WHAT'SNOT INCLUDED Remote. ITEM APPEARANCE. Working projector, lamp needs to be replaced and no remote included. Includes:1 Projector, remote, carrying case. Therefore, the box does have dirt marks on it but it does not affect the product inside. 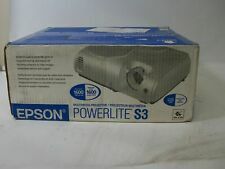 Epson PowerLite 720C Multimedia LCD Projector 2000 ANSI 1024x768 w/ Bag. Condition is Used. This has been tested and working. Light wear from normal use. Does not include box, manual, or remote. Has around 1500 hours on the lamp. Powered on and stayed on. It powers and displays normally with excellent focus and image quality (flaws seen in the photos are on our wall). This has been tested via the VGA port and it is in good working order. Includes working lamp and power cable. Unless otherwise stated, this has been tested for key functionality. Trending at $66.50eBay determines this price through a machine learned model of the product's sale prices within the last 90 days. Lightweight, travel-friendly projector that doesn't sacrifice brightness. Password-protected security features, plus operation lock to prevent unauthorized usage. HDTV, NTSC, and PAL signals; composite, S-video, and component inputs. This has been tested via the VGA port and it is in good working order. Includes working lamp and power cable. Unless otherwise stated, this has been tested for key functionality. We are otherwise not open to the public. We are otherwise not open to the public. Model EX9200. ZERO LAMP HOURS. You will get all from the pictures. Model Number: H371A. All manufacturers' warranties are void unless otherwise stated. Item is used. Item has been tested and works. You will receive the Item pictured. Resolution - native WXGA (1280 x 800). Lamp Life - 4000 hours. Weight - 3.7 lb. 3LCD technology ensures natural color and bright, vivid images for brilliant presentations that are sure to impress. Transport it from one classroom to the next, or install it in the boardroom. 964 high brightness & 380 low brightness hours. What's Included?. What is the history of the item?. We test them and picture their current condition. Unit was power tested and left running for 1 Hour straight. (1x) 2 prong power cable. Unit is in good condition. Unit has no dead pixels! Model #: H363A. WiFi module and power cable included. Batteries for remote are NOT included. Item is in great condition with zero lamp hours. For complete specs, check out the link below. This has been tested and it is in good working order. Includes working lamp and power cable. Unless otherwise stated, this has been tested for key functionality. We apologize for any inconvenience that this may cause. What you need to know – This product may have a serial number that uniquely identifies the item. Epson Pro EX9220 Wireless 1080p+ WUXGA 3LCD Multimedia Projector - Open Box New! Give us a call: 1-800-375-PAWN. Tested working. Quantities available. Lamp hours will vary. In most cases response is between 0-6hrs. POWERLITE 821P. 821 LAMP HOURS. ONLY WHAT IS PICTURED IS INCLUDED. This has been tested via the VGA port and it is in good working order. Includes working lamp and power cable. Scratched all over the projector. We are otherwise not open to the public. Unless otherwise stated, this has been tested for key functionality. Model: H284A. Notes:This projector powered on normally. The projector displayed a clean and focused image. This projector is in very good condition with minor scuffs or scratches from previous use. (PROJECTION LENS Lens Cover : Attached. LOW BRIGHTNESS MODE : 30dB. FAN NOISE WEIGHT : Approx. 4.0Kg / 8.9lb. 272D) x 350(W) x 109(H) mm. Lamp ON : 280W. All are in good working condition, with various hours. Hours of Operations: Mon- Fri 10AM to 5PM EST. Our Standards. We are a team of experts who are flexible, attentive, and responsive. NurTech Technology, LLC, was established in 2006. About NurTech Technology!